Research shows that stone fruits, like peaches, plums and nectarines, are high in phenolic compounds that work to reduce oxidation of LDL cholesterol, which is associated with the development of heart disease. In another study, researchers found that compounds from some types of peaches and plums are active against estrogen-independent breast cancer cells in vitro. Peaches are a summer stone fruit. Check out your local farmer’s market or grocery store during the months of June – August to stock up! 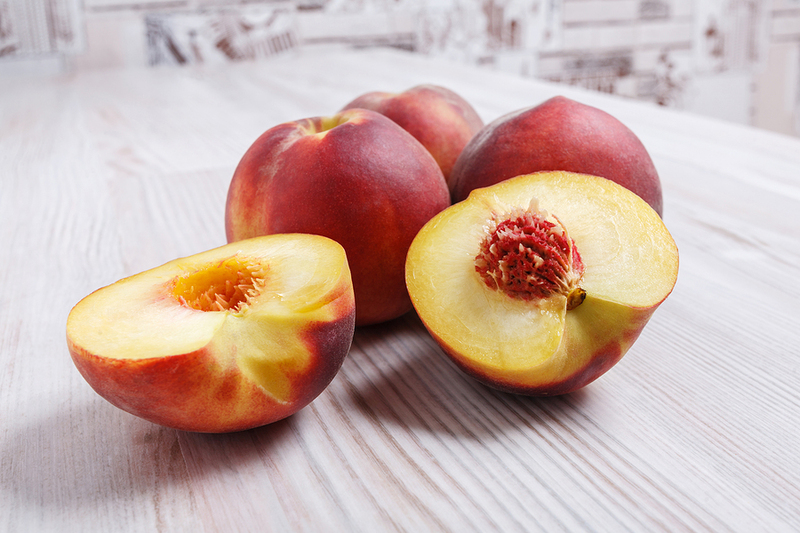 When browsing the selection, choose peaches that are firm to the touch and don’t have bruising. If peaches are unripe when purchased, try storing them in a paper bag at room temperature to ripen more quickly! Peaches can be stored at room temperature for 1 – 2 days for immediate use, or put them in the fridge and eat within 5 days. Before that first bite, rinse with cold water first. Get the most out of this summer treat by washing, slicing and freezing for use later in smoothies and homemade desserts. Peaches are the perfect snack eaten raw. Try them atop a breakfast favorite like cereal, yogurt or waffles or add to your salad or sparkling water for a sweet taste without the added sugar! Try grilling peaches for a simple dessert, or cook down and add to savory protein dishes.